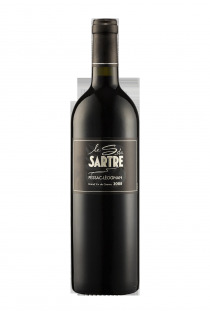 Products of the domain : Château Le Sartre. n the middle of the 19th century, the Rouanet family acquired and developed the estate of Sartre , bordered to the south and west by the Esteys "du Sartre and the Eau blanche small tributary of the Garonne The crisis of the phylloxera then the two world wars have greatly damaged this vineyard of Bordeaux. In 44, at the end of the Second World War, the last vines of the Sartre were torn off and the property fragmented until the arrival of the Perrin family nearly thirty years ago. 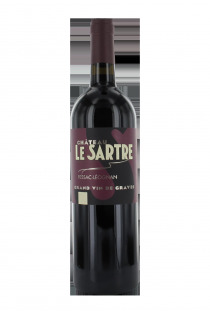 Located in the south-west of Léognan , close to the Domaine de Chevalier and the Chateau de Fieuzal, bordered by the large Landes forest, the vineyard of 35 hectares is divided into 2 blocks, one on the Château Le Sartre site Ha) and the other to the north on the Bois Martin site (9.4 ha). The soils are very varied: gravelly, clayey-sandy, clayey, sandy and alluvial. Merlot (50%), Cabernet-sauvignon (45%) and Cabernet Franc (5%) for red and Sauvignon (80%) and Sémillon (20%) for white. The culture of Château Le Sartre is based on the principles of reasoned agriculture , with the utmost respect for the environment. Le S du Sartre - 2014 - Château Le Sartre. Le S du Sartre - 2015 - Château Le Sartre.